Farmers like these need better safeguards against pesticide exposure. Looks like the Environmental Protection Agency finally has to ban a certain pesticide. 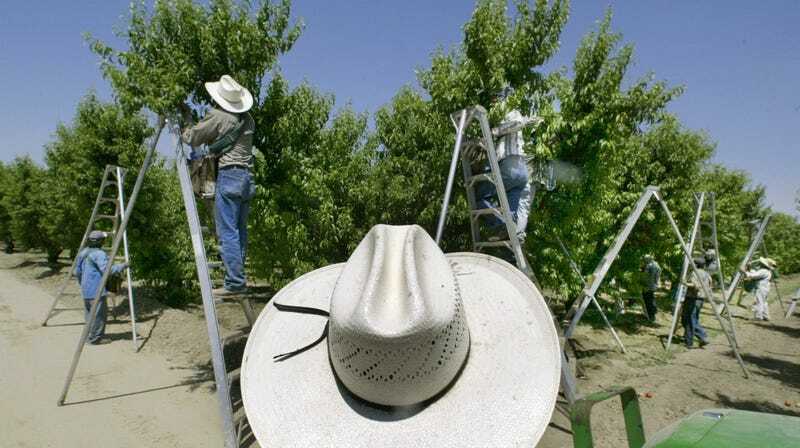 An appeals court ordered the agency Thursday to quit delaying the ban on chlorpyrifos, which advocates had been pushing the agency to do since 2007. The U.S. Court of Appeals for the Ninth Circuit issued its ruling because chlorpyrifos is a pesticide linked to neurodevelopmental issues for children who leave near farms where the pesticide is being put on crops. As the EPA made clear in a 2016 assessment, levels of chlorpyrifos in food were also higher than the agency considered safe. If it were up to the current administration, workers dealing with the pesticide would’ve included minors. This latest 2 to 1 court decision gives President Donald Trump and his EPA minions 60 days to finalize a ban on the pesticide once and for all. And it’s about time. Groups like the Natural Resources Defense Council and Earthjustice first filed a complaint on chlorpyrifos in 2007. Three years later, they headed to federal court. Finally, in 2015, the EPA (under then President Barack Obama, whom we miss very much) announced it would move to ban the pesticide from agricultural uses. Well, then Trump happened. So, you know how that goes: It tried delaying this ban under former Administrator Scott Pruitt. But it turns out the courts are still good for something. “If Congress’s statutory mandates are to mean anything, the time has come to put a stop to this patent evasion,” read Judge Jed Rakoff’s opinion.